I dug out my puncture repair kit, and set to work. It was the same wheel I struggled with when I replaced the tyre a little while ago, but I figured with my new-found wisdom on how to remount the tyre, things should be much smoother. And indeed they were, although as it turned out it wasn’t a puncture at all, but the patch I had put on the tear in the tube had failed. This was the tear, you may recall, that I made with tyre levers whilst struggling to remount the tyre last time. This did make me a little embarrassed. I mean, having a patch fail. Come on. In my defence, it was a large-ish tear (perhaps 8-10mm across) which can be hard to patch successfully, and given I have so few punctures my repair kit is invariably dried up and dusty. Not that’s really much of an excuse. Anyway, I put the spare tube on in its place, and all was well. I even managed to re-mount the tyre using only my thumbs. I was quite taken by this poster for the Hunter’s Hill family ride. Well done, Hunter’s Hill, for holding a ride not predominantly aimed at sports cyclists, and also for not including a single sports cyclist in the picture on the poster. I was of course most taken of all but the fact that the front two riders appear to be not wearing Australian regulation headwear, given one has a sun bonnet, the other a flat cap. I hope this subtle message is a deliberate anti-MHL stance by Hunter’s Hill Community Services. I wan’t able to go to the ride, but was heartened when I saw that the website was similarly devoid of any mention of helmets. Indeed, they didn’t even mention in the ‘rules‘ that you had to wear one, which is almost unheard of (every other organised cycling event I have ever looked at says ‘helmets must be worn’ almost as the first thing). Next year, I must try to get along. Wearing my best flat cap, of course. I had to double check that I hadn’t already looked at the mainstay of the Arnott’s savoury cracker range, but it seems it has been thus far overlooked. Or perhaps I had thought about it, but always struggled. You see, there’s really nothing whatsoever to say about these biscuits. You see that picture of them, a bit lower down? Well, they taste exactly as you expect from looking at that picture. They are plain crackers, perfectly nice with some cheese, with a few grains in them to add texture. They taste like, erm, plain crackers with some grains in them. Oh dear, this isn’t going too well, is it? I mean, I do have some standards, and a minimum word count is one of them. After all, you are paying to read this, and you expect at least something for your money. The only other vaguely interesting thing I can say about these is that Girl Chillikebab #2 liked the box, and stuck a load of glitter, ribbons, cotton wool and coloured paper to it before announcing she had made it into a marshmallow machine. Fully working, I might add. That is if you like imaginary marshmallows. I’m going to give these really quite nice crackers a seven out of ten, but then subtract a penalty point for being boring. Well, somehow this one slipped through the net. Apparently it was created for Valentines Day back in February, but I only just came across it. It’s another Zumbo flavour, and I have no doubt that it came about as a direct result of this very blog. You see, when I looked at the previous Zumbo attempt at a raspberry Tim Tam, I noted that, based as it was on the exceptionally ordinary Tim Tam White, it was never going to amount to very much. An improvement, yes, but with such an unprepossessing foundation it was never going to be a classic. I’ve also previously noted that the Tim Tam Dark is the best Tim Tam. No, I’m not going to argue the point. If you disagree, you are wrong. Evidently Mr Zumbo has been reading this, put two and two together, and made – well, we’ll see how much in a little while. The Tim Tam Raspbery Choc, you see, is made with that fabulous rich, moreish Arnott’s dark chocolate. This puts it firmly on the path to success from the outset. I suspect that Mr Zumbo has also tweaked the filling, as it has a slightly more scented, aromatic quality – almost like a liqueur. The net result is a smooth, satisfying and decidedly grown-up Tim Tam. Which I am shamelessly going to take all the credit for. 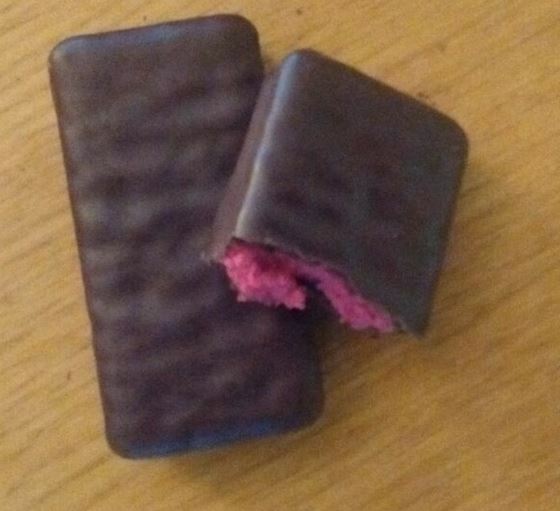 In this case, then, putting two and two together comes out with a solid nine out of ten for the Tim Tam Raspberry Choc. Good stuff. For the most part, I avoid the whole internet slang and emoticons shtick, but just occasionally I see something for which they just seem perfectly apt. Which is why, when I saw Choc Chip Scotch Fingers for the first time, my reaction was simple. It’s all just so obvious, but so inspired. ‘Twisted’ indeed. These biscuits, I felt, could be dangerous. You just say the words ‘Scotch Finger’ and ‘Chocolate Chips’ in the same sentence, and it begins. you just want some. You just want some really really badly. Before you’ve even tried them, you need more of them. I was trembling with excitement as I opened the packet. Here they were. My first thought was actually that they don’t look very attractive. Kind of blotchy and a bit odd. Something to do with embossed lettering and choc chips, I think. Oh well, never mind that, let’s press on with the devouring. And devour them I did. the whole packet was gone in a matter of minutes. They really are pretty good. But but but. Note quite as good as I hoped. Somehow they just don’t quite hit the mark. Possibly a tough gig, given the high expectations. But the chocolate just wasn’t pronounced enough. They need larger chocolate chunks, I think. Not necessarily more chocolate, but fewer, bigger pieces (This is a problem I’ve had before; Arnott’s seem to struggle with larger-than-normal chocolate chips. Perhaps they could upgrade their chocolate-chip machine?). Overall, I’d probably say the Chocolate Coated Scotch Finger is actually better. All of this is, on reflection, perhaps a good thing. Perhaps Arnott’s deliberately restrained themselves when creating these, knowing just how dangerous they could be in the wrong hands. I’m going to give these a seven-and-a-half out of ten. They are good. But nowhere near Lemon Crisp territory.